Join us for the 1st Annual Empty Bowls Fundraiser and STEAM Family Night! 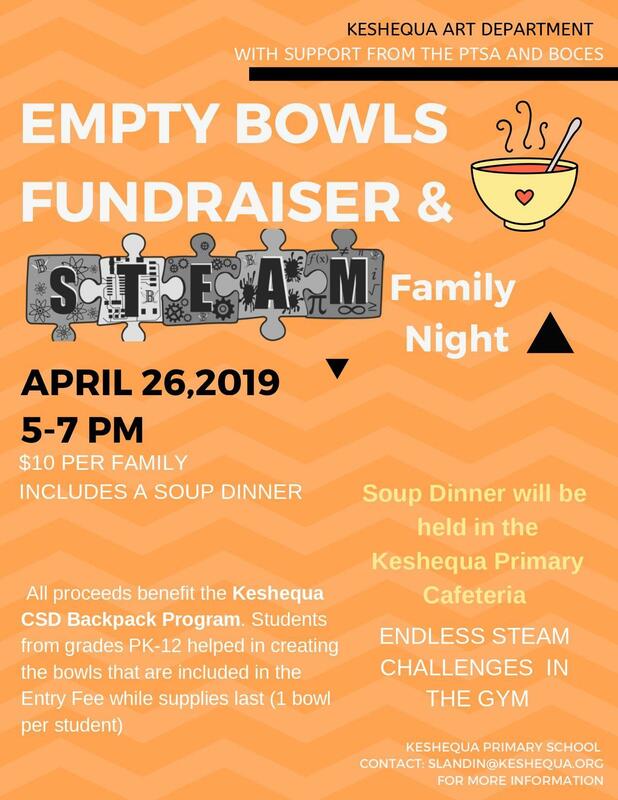 Keshequa Art Department, with support from KPTSA and Genesee Valley Educational Partnership, will host the 1st Annual Empty Bowls Fundraiser and STEAM Family Night on Friday, April 26 from 5-7PM. Join us at the Primary School for a night for family STEAM activities and a delicious meal of soup, salad, and bread. For ten dollars, a family will enjoy games, a meal, and walk away with hand-crafted bowls created/designed by their child(ren). All proceeds will benefit the Keshequa Cupboard Backpack Program.